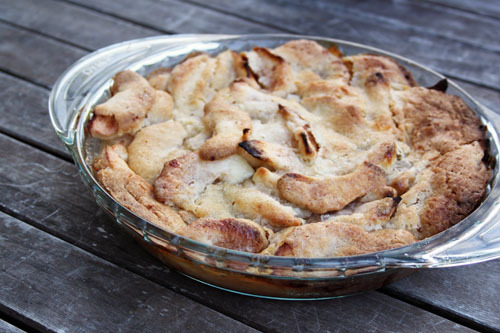 Fill a pie plate or any 8Ã—8 casserole dish/pan with sliced apples. Only the center can be slightly above level with the top of dish or the topping will spill over the sides, so don’t get carried away. Sprinkle the apples with ~ 1 tablespoon cinnamon sugar. Mix together the butter, sugar, flour and egg. Pour evenly over apples, sprinkle with more cinnamon sugar if desired. Bake at 350 degrees F until deep golden brown - around 40-45 minutes or so.